Discovered among the antiquarian stacks of the Bodleian Library, this authentic work of seventeenth-century English magic has been meticulously transcribed and annotated by Daniel Harms and illustrated by James R. Clark, who previously collaborated on the bestselling Book of Oberon. With a comprehensive introduction, annotations, and more than one hundred figures and illustrations, this beautifully reconstructed historical work is filled with never-before-published rituals for calling forth demons, fairies, elementals, and other spiritual beings. This elegantly bound book provides new insights into a fascinating tradition, where a sorcerer or cunning man was paid to perform magic for uncovering theft, combating witchcraft, hunting for treasure, healing, or bidding a spirit to fulfill one's commands. Additionally, the unknown scribe who created the manuscript included brief excerpts from other important magical sources as well as several lists of spirits, some of which specify spirits not mentioned in other published materials. As an additional feature, this deluxe edition retains the red type found in the original manuscript to emphasize keywords. With more than fifty spells and extensive annotations and appendices for contemporary practitioners and collectors, this is an essential work of magic from a unique and compelling source. A breathtaking work of English magic with scholarly annotations and vibrant reconstructions of the original art. This edition of an essential seventeenth-century manuscript, thought to be a practical grimoire that was used by a working cunning man, includes fascinating commentary that situates the material in the context of its time. With detailed notes on Thomas Allen and other key figures who actively collected and preserved priceless occult manuscripts, this introductory material also explores the genesis of the Bodleian Library at Oxford, the cultural rifts that resulted from the state's break with Catholicism, and a unique explication of the customs and mores of the era's intellectuals. 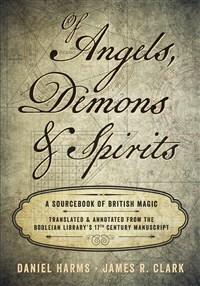 Readers will also gain valuable insights into how this grimoire compares to other works of magic from the seventeenth century, detailed commentary on the period's cosmological and theological views, and a description of the attitudes toward demons, angels, fairies, and other spirit entities. These annotations by one of the foremost experts in the field provide nuanced perspectives on the milieu in which the original manuscript was created and used, a welcome addition for those who are interested in the enigmatic provenance of such an important work. Daniel Harms (Upstate New York) holds two masters’ degrees, one in anthropology and one in library and information science. His major area of research is magic from antiquity to the present, and he has been published in the Journal for the Academic Study of Magic and the Journal of Scholarly Publishing. Harms is also the author of two books on horror fiction and folklore. James R. Clark has been working in various fields of philosophical and esoteric study for nearly two decades. His primary areas of focus are philosophy of number, Golden Dawn, and alchemy. James is a self-taught artist. He has illustrated The Essential Enochian Grimoire, the seventh edition of Israel Regardie's Golden Dawn, and The Book of Oberon.